Scooby-Doo! 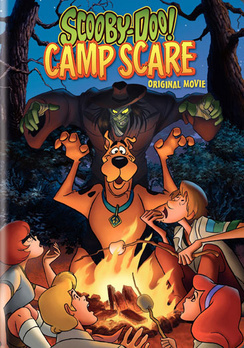 Camp Scare: Original Movie is the fifteenth direct-to-dvd animated movie based upon the Scooby-Doo Saturday morning cartoons and is the scariest Scooby-Doo animated film that I have seen so far. This film tells the legendary story of the time that Scooby-Doo and the Mystery Inc. gang travel to Camp Little Moose, which happens to be Fred's childhood summer camp, to become camp counselors, but all is not well as the camp is close to being abandoned, after a series of attacks from an axe wielding woodsman, a ferocious fish-man with razor sharp fins and a shrieking Spector, straight out of hell and the gang, along with a few left over campers, have to band together to solve the mystery and save the camp. The film is highly enjoyable for both adults and kids alike, although it could be considered way too scary for some very young or easily frightened children and for those of you who like a good scare, make sure you keep watching till the very end of the credits and for those of you who happen to fancy the character of Daphne Blake, you'll be happy to know that throughout the majority of the film, she wears lots of skimpy clothing, including a lovely bikini. After the film, if you're still hungry for more Scooby-Doo action, then you should head over to the Special Features of the DVD menu, where you will find Scooby-Doo Spooky Camp Stories: Three More Good Scares! which incorporates both live action and a few scenes from the movie, which tell some very eerie tales indeed. You will also find the very first episode episode from the Scooby-Doo! Mystery Incorporated television series, by the name of "Beware The Beast From Below" in which the gang discovers a disgusting slime mutant that lives beneath Crystal Cove and is cocooning anyone who gets in its way, leaving them suspended, looking disturbingly twisted and contorted, yet somehow still alive and it's up to the Scooby-Doo and the gang to uncover the terrible truth behind these horrendous crimes. Scooby-Doo! Camp Scare: Original Movie is rated PG for scary scenes and was originally released on DVD in 2010.